All-terrain vehicles (ATVs) are used by fire and police departments across the nation to get to places that a traditional fire truck or vehicle cannot. 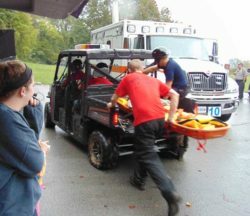 After a 12 year old girl fell and broke her leg on a trail in Tennessee, rescuers needed to act fast. With large storms coming in, the Hamilton County Special Tactics Rescue Service (STARS) drove their donated ATV to get closer to the patient and transport her to safety. This vehicle made it easier on both the patient and rescuers, resulting in a positive outcome.